Healdsburg, CA was Lin Fischer's birthplace (born Linda Parsons). She is a third generation northern Californian. Growing up in Sacramento was pleasant until she discovered the bay area, which immediately attracted her. Lin's BFA in painting was earned at the University of California, Davis, where Wayne Thiebaud was head of the fine arts department. Roland Peterson was also one of the influential instructors at the University. The MFA came later from the Academy of Art College in San Francisco where, after graduating, Lin taught painting to Masters candidates, and Design and Color to undergraduates. 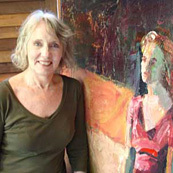 Other teaching included Experimental Figure Painting at the California College of the Arts Oakland, at additional venues in the east bay and Contra Costa County, and with private students in her studio. Lin Fischer currently lives in Berkeley, California. She has shown her work in the San Francisco Bay area and across the nation.